Hingham High’s Jessica Pollard led a class in Mandarin Chinese, which is taught in about three dozen school districts in Massachusetts. 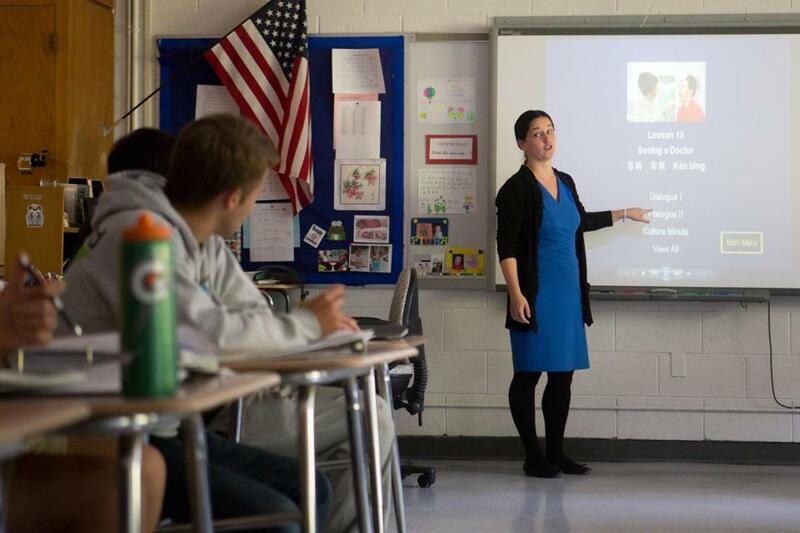 Students at Walpole High School can learn French, German, Latin, Mandarin Chinese, or Spanish. At Hull High School, students have only one choice: Spanish. Massachusetts doesn’t require languages other than English to be taught, and the wide disparity in foreign language requirements and offerings is a fact of life in public schools across the region. “There are certainly very strong programs in Massachusetts, but it’s a commitment on the part of the [local school] district,” said Nicole Sherf of the Massachusetts Foreign Language Association, a nonprofit group pushing for a state requirement for foreign language education. Sherf said her organization also is trying to get the state Legislature to create a “seal of bi-literacy” on high school diplomas to recognize students with foreign language expertise. Nationally, about 16 states make foreign language classes a requirement for high school graduation, according to Martha Abbott, executive director of the American Council on the Teaching of Foreign Languages. The group is planning a public relations effort to promote foreign language instruction as a national priority. Facts and figures about foreign language instruction in the schools south of Boston. While Massachusetts doesn’t require foreign language instruction, the state Department of Elementary and Secondary Education does recommend at least two years of it for high school students, according to spokeswoman Jacqueline Reis. And state guidelines issued in 1999 say high schoolers should become proficient in at least one language other than English, meaning they should be able to “speak, read, write, and understand” it, she said. Following through on those recommendations, however, is solely a local decision, Reis said. And she said the state doesn’t have anyone assigned to keep track of the subject, a sore point for Sherf’s group. The state’s latest data on which languages are taught in local districts date back to the 2009-2010 school year. Those statistics showed that Spanish was the most popular foreign language, taught in about 220 high schools in the state. French followed closely, at 214 schools. Next on the list? Latin, remarkably, taught in about 125 districts. 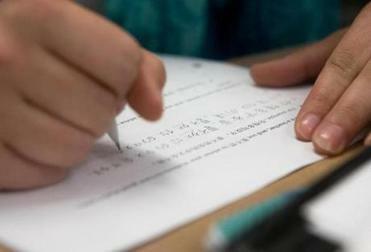 A student wrote Chinese characters on a packet during class at Hingham High School. About 35 districts — including Canton, Walpole, and Weymouth — offered German. A similar number taught Mandarin Chinese, including high schools in Brockton, Hingham, Marshfield, Quincy, Sharon, Walpole, and Whitman-Hanson. About 20 districts — including Brockton, which has no foreign language requirement — had classes in Portuguese. A handful, including Middleborough, taught Russian. Norwell High School was one of four public high schools teaching Arabic. How schools decide which languages to offer can be quirky, according to Sherf. National trends also play a role, with Chinese instruction, for example, currently hot. “Chinese is happening all over the country; you’re just as likely to hear about a new Chinese program in Iowa as in New York City,” Abbott said. Hingham High School started teaching Chinese about 10 years ago, sparked by student and faculty interest and the fact that a new history teacher was fluent in Mandarin, according to principal Paula Girouard McCann, who has traveled to China twice since then on student trips. Hingham High, which has about 1,130 students and 13 foreign language instructors, requires students to take two years of the same foreign language, and Girouard McCann said three years is the norm. “Some kids will double up and take two languages; that’s certainly a trend,” she said. “Spanish continues to be the most popular, but Chinese is definitely growing in popularity, and Latin isn’t falling off. French is holding its own, too. “When you grow up in a small town, your perspective is broadened by studying another culture. It’s just eye-opening,” she added. Money is another factor determining what languages students have a chance to learn. Hull public schools, for example, cut Spanish language instruction at the middle school in 2009 when the economic downturn led to major budget troubles. The schools were in good enough financial shape to restore the classes this school year, but not good enough, said Superintendent Kathleen Tyrell, to offer middle and high schoolers anything beyond Spanish. In Walpole, support for foreign language classes was one reason voters approved a budget override in 2012, according to Assistant Superintendent Jean Kenney. The high school requires one year of foreign language, but almost all students take at least two years and many add a second language, she said. Walpole High is one of the few public schools in the state that offers German, a language that former foreign language chairman George Watson championed because he wanted to offer students a non-Romance language. Current department chairwoman Lisa Osborne said about 45 students study German, and about two dozen go to Germany in February in an exchange program that brought the same number of German students to Walpole this fall. The most popular language at Walpole High is Spanish, with about 600 students and an exchange program to Costa Rica, she said. French is holding steady with about 150 students, as is Chinese, with about 30, she said. “Latin is increasing enrollment,’’ she said. The ancient language now attracts about 100 Walpole students to the beginner classes, most of whom continue for a second year. “We have a nice trend of students starting Latin in freshman year and staying with it,” she said. Arabic is a growing discipline at Norwell High School, which first offered the language at the urging of teachers in 2009 and now has 25 students in the introductory class and 10 taking Arabic II, said principal William Fish. Fish noted that Norwell High — which also teaches French, Spanish and Latin — requires students to take a foreign language for three years. “The three-year graduation requirement allows more students to develop the language learning skills necessary to approach or meet fluency in the language they study. Our goal is to support students to become fluent in a language other than English,” he said.